If you've got a little one learning to count, take them on a colourful and whimsical adventure with this visually beautifully picture book. Lily is bored and, for something to do, starts counting everything around her: her toes, her teeth, the stripes on her dress. 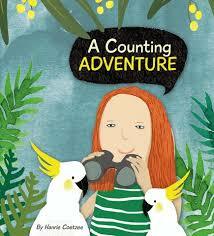 She quickly runs out of things to count but soon spies a glorious array of Australian wildlife, perfect for counting. A love of nature shines through in this delightful counting book. Artist and illustrator Hanrie Coetzee has travelled widely to study wildlife and wrote this book while living in Melbourne. Her vibrant illustrations exude a childlike naivete that will charm children and adults alike. Told in a sweet and simple rhyming text, the book aims to inspire an appreciation of the diverse and wondrous beauty of the natural world. And it encourages children to look more closely at the little things around them.